Inside Grocer’s Daughter Chocolate shop, the warm, natural colors and it’s simple decor are comfortable but not pretentious. 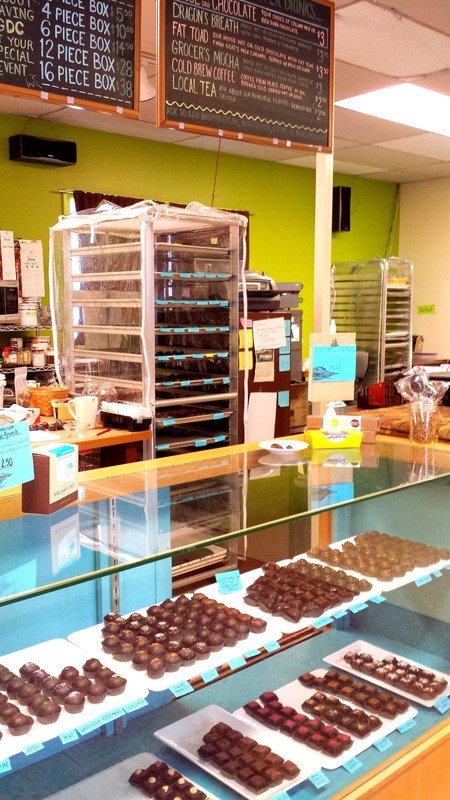 Wooden crates and baskets filled with different chocolate creations line the walls. 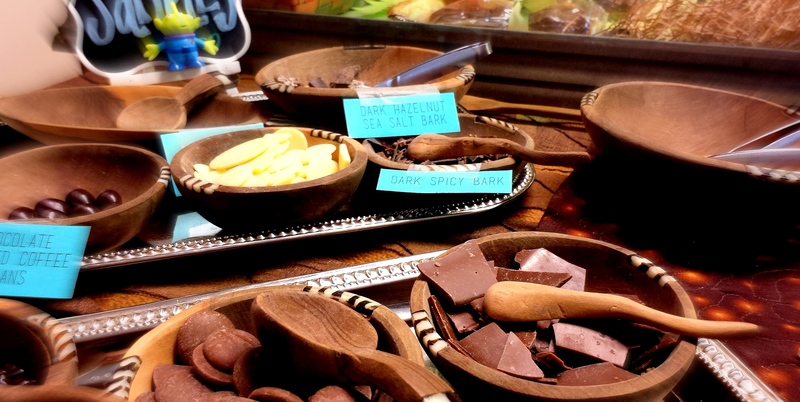 As you enter, to the left is a collection of some of the unique chocolate choices they offer on a generous sampling table. Straight ahead, all lined up in a glass display case, I found the house specialties. Truffles and Caramels. I didn’t find anyone meditating. Still, this was going to be worth the trip. I could just tell. 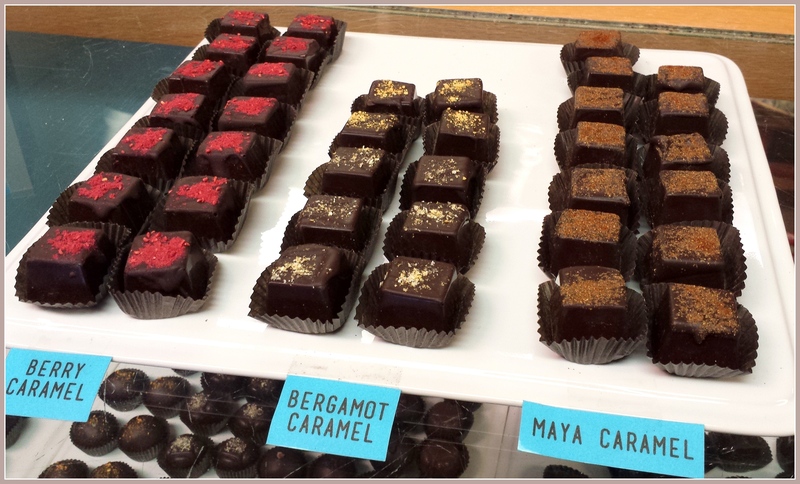 In addition to sampling unusual chocolate treats that you may or may not have ever experienced before, (like chili dusted spicy bark or unsweetened chocolate nibs) you’ll get the whole background story on chocolate. 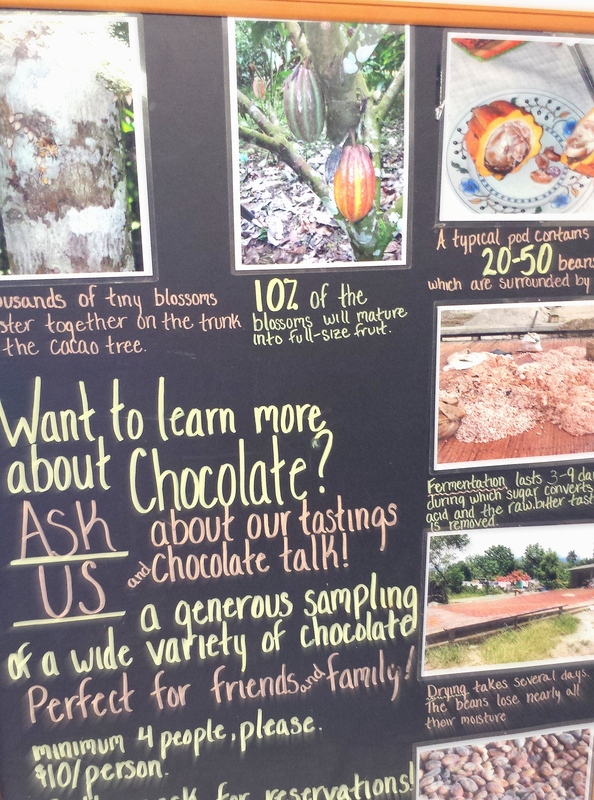 You can learn by reading the writing on the walls (literally), or you can take a class from a chocolate expert. From the farmers who grow it, to the process it goes through to become the chocolate we know and love, you’ll leave with a full understanding of chocolate. Ashley was there to help explain it all to me (and my friend Andrea) today. She was friendly and eager to share her knowledge. Who knew there was so much to learn? I had never questioned my chocolate before. There was never any reason to. Although I have often wondered as I have matured, is it my taste that has changed over the years, or the quality of the chocolate that is readily available? I think it’s a little of both. They visit the chocolate farmers in Equador every year so they know the farmers that grew this cacao. That’s pretty cool. She said more, and I think Andrea heard more than I did. Honestly, I wasn’t really listening very well. I was actually quite distracted. Well wouldn’t you be? 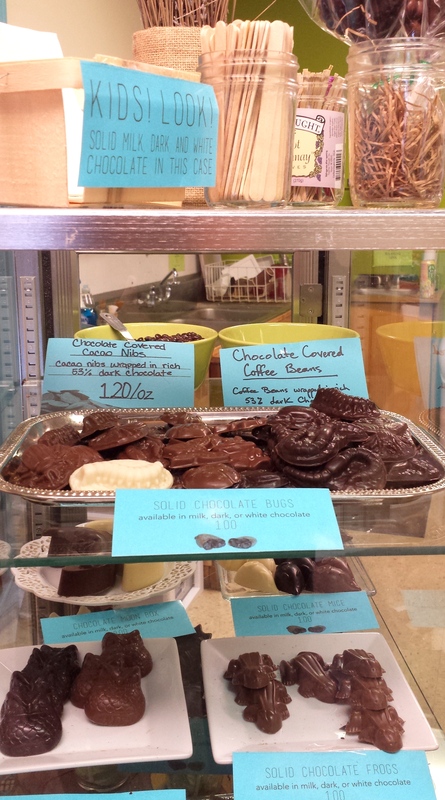 These shiny chocolate pieces, so beautifully displayed, were calling my name! I imagined Ashley and her co-workers rolling out the little chocolate balls while meditating and I could hear a low steady hum like monks in a monastery. My mind wandered. How did they get them so shiny? Mine never turn out quite like these. It has something to do with the temper, I hear Ashley say. Apparently they know something I don’t. I should have been a better listener. Do they have short tempers and that’s why they need to meditate? This is what I did hear: each of these little perfections are made with rich chocolate on the outside and a soft chocolate center which is then delicately flavored. The various truffle and caramel flavorings on this day included Lavender, Basil, Thyme, Mint, Apricot, Honey, Cherry. Raspberry, Sea Salt, Nutty, Maya, Pomegranate Ginger, and Espresso. Plus Grand Marnier, Cognac, Whiskey and Stout. At $2.25 each or six for $12, you get a lot of bang for your buck. For the little ones at home, I brought some molded chocolates in a variety of shapes; milk chocolate bears, mice and frogs, for just $1 each. For myself, I chose to try a Lavender Truffle and a Nutty Caramel. The Lavender Truffle was dusted on top with bits of bright purple lavender. The Nutty Caramel was filled with organic caramel made with local organic cream and honey. No high fructose corn syrup here. 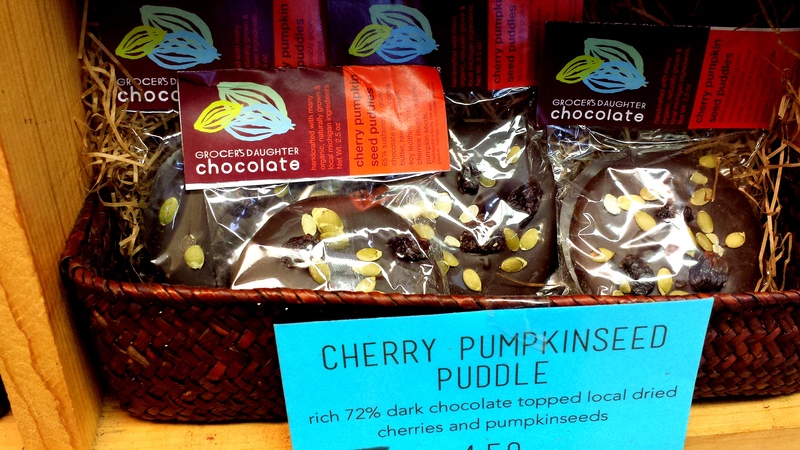 They use local and organic products whenever possible. Even the whiskey and stout are locally sourced, as are the flowers, herbs, fruit, nuts, milk, cream, honey and maple syrup. Being just outside of Traverse City, it’s no wonder they call Traverse City a foodie town. 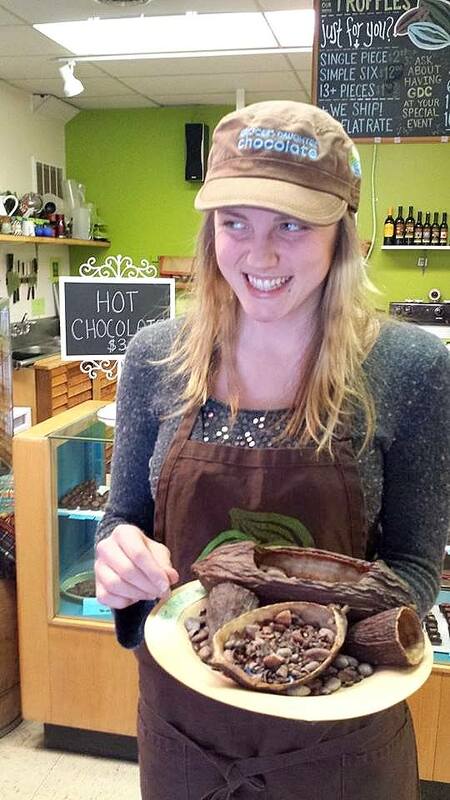 Andrea tried a Bergomot Caramel and she said “The bergamot made me feel like royalty”. Her husband Neil, who enjoyed a Stout Truffle said “The stout was amazing! It had just a hint of the stout flavor, not overpowering or bitter”. My truffle and the caramel were both amazing too. I don’t know why their chocolate is so much better than other chocolate, but it really is. Maybe Ashley explained that while I was all goo-goo ga-ga over the truffles. Maybe you need to go there to find out for yourself. 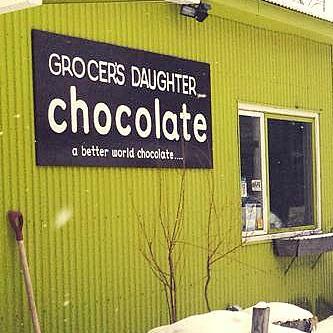 If you are able make it out to Empire this week, there is still time to fill your Easter basket with chocolate bunnies from Grocer’s Daughter. Or maybe you can find it in a store near you. Personally, I can’t wait to go back to Empire and to Grocer’s Daughter. I think I’ll get some dark chocolate covered Chocolate Nibs next time around. If it turns out I can’t wait until then, I can always order online. You can too! Monday, Thursday, Friday, Saturday: 10 am to 6 pm. Sunday: 11 am to 5 pm.